This time of the year is especially meaningful for me because it was on Ash Wednesday in 2004 that I was invited to join a large youth group to see The Passion of the Christ, the controversial film about Jesus’s arrest, trial, flogging, and crucifixion. I wrote about this in fuller detail last year, so I’ll just say here that as a result I had a profound, perhaps even miraculous experience of Jesus and a subsequent acceptance of his claim on my life. I was surprised, even confounded, that not everyone, and in fact, no one else I know personally, has had the same experience I had in watching the movie. I thought everybody would have the same experience I did! All they had to do was see it, and they would finally get that something is wrong with the world and something was so totally right about Jesus! But that’s not what happened. So what me? Could my experience be explained by the horrific violence? Maybe it sparked great sympathy on my behalf for the main character. While I remember being repulsed at the violence like anyone would, what stuck with me was not the beating and the lacerations and the nails. What I remember about that experience is that somehow I met the Jesus whose character and personality is revealed in the New Testament, having not grown up to that point reading the Bible or going to church all that much at all. And it wasn’t that I was moved that such a person was offered as a sacrifice for my sins — I don’t think my theological or biblical understanding was nearly that advanced at the time. It was rather that somehow I understand that this was the ideal human. This is what humanity was meant to be and should be–but this perfect human faced rejection by his own fellow humanity and death at the hands of those he came to serve. It was disappointing to me that others didn’t get this as easily as I did. But on the other hand, if I was only shocked by the violence, or moved by the realism, more people I know should’ve had the same experience. I think that what this shows is that I didn’t just have a theatrical experience. In the way God would have it, he used a film to reveal to someone, who actually was an aspiring filmmaker at the time, what needed to be revealed. Yes, somehow in watching film projected on a screen, and watching Jim Caviezel put on the costume and read the lines, and in despite of some of the legitimate criticisms of the movie’s artistic choices and marketing gimmicks, I met the Jesus of the New Testament, the one whose equality with God didn’t keep him from taking on this world only to face Roman execution, but who humbled himself to receive the rejection of people who just simply didn’t understand what they were doing. It’s pretty notable that for the several days after the movie when I lost sleep and appetite and couldn’t get my mind off of anything but Jesus’s death, I don’t remember feeling like my biggest problem was the need for forgiveness of my sins. As sick as I was over my own brokenness, I don’t remember thinking what really needed to happen was that my sins be taken care of so I could go to heaven. Now forgiveness is crucial, and that would come. But I don’t remember being consumed by the question of where I was going to go when I died, although that’s how so many preachers articulate what it means to become a Christian. Heaven and hell and forgiveness — that would’ve been all about me, me, me. The real problem was that I couldn’t help thinking that there was something I was supposed to do in genuine response to Jesus because of who he was and what he had done, not simply how I could benefit from it. And so, though the resurrection of Jesus forms the happy ending of the movie, I was sad and confused from Wednesday night to Sunday morning. I didn’t feel that resurrection, yet. It was as if the movie had ended for me with a dark, cold tomb with a body on the inside. Sunday came, and I went to the church that had taken the bus loads of people to see the movie. I don’t remember what the sermon was about. But I remember the invitation at the end, which was that I could give my life to Jesus. And I knew that was exactly what I needed to do. Not knowing anything about how that invitation was something they did every Sunday, not knowing anything at all about how some people supposedly hesitate to go forward for those invitations, I got up and marched straight to the pastor because he said I could give my life to God. It is at that point in time that my life divides in two. It all goes back to the moment that I decided to give my life to the one who claimed it and could do something with it. It goes back to the point that that I understood the happy ending of the movie when Jesus rises again, and I was able to live in it. And the past nine years have been nothing short of unbelievable. Both in regards to how difficult they have been, and in regards to how glorious they have been. Here’s what I’m thinking on this Good Friday as someone who has been on this journey for a little while now, in light of how it all began for me. How many people have not grasped the real substance of Christianity because they thought it was about saying a prayer for salvation to go to heaven when they die? Though I wouldn’t realize it for years after I became a Christian, the main point of it all is who Jesus is, not what I get for asking him to forgive my sins. The very nature of the gospel, or good news, is not a plan of salvation, after all. The good news is not that all of life, much less all of church and all of Christianity, is about me and my salvation. 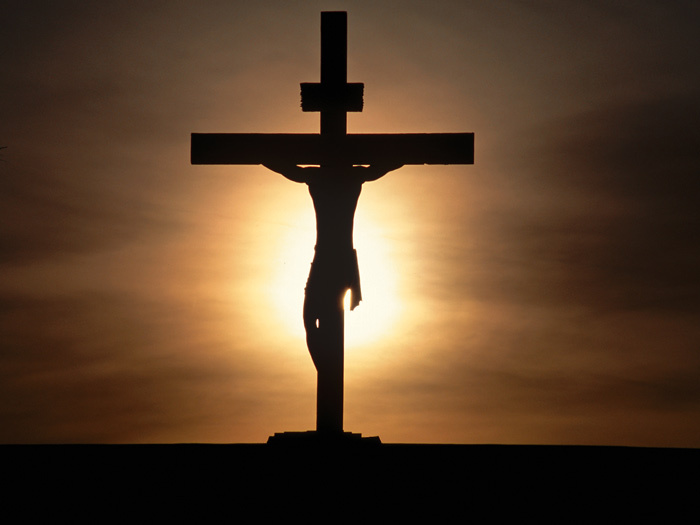 The good news is that the perfect human Jesus though crucified is raised as Lord. And that’s Lord over all, including not only what happens to me after I die, but also, and I would say more importantly and urgently, the life that I live now. As I have gone through growing pains and shrinking pains and been stretched and torn in so many parts of my theological belief system, it is the character of Jesus who I met first in the theater and who I meet in the New Testament and who I meet in others that remains the same. And in meeting the character of Jesus, and not just a sacrifice on a cross, I realized that though I am reeling over my sin, I’m not supposed to end there. Too many Christians end there. They start and stop with a Jesus that dies for their sin, so what does it matter who he was, much less who he is? It’s not about me; it’s about what God would do through me, for us, and for this world. And so we don’t need only a man hanging on a cross, or even one who rises out of the tomb. We need a living, reigning, present Lord. This is the truth that I strive to make more real in my life every day. This is beautiful Nathan! Thank you for continuing to share your story. Thank you John! I’m so glad you took the time to read it. Thanks so much Nate. Really, really appreciate this reflection…I wonder how many other people around the world had the same experience?